Norooz is the Iranian New Year, which is celebrated each year at the beginning of spring, on March 21st. It is the most important holiday in the Zoroastrian calendar and brings a wealth of symbolism, history, myth and joyous festivities. There are many layers of meaning to Norooz: astronomical, mythical, historical and spiritual. The word Norooz, means "New Day", and the primal origin of the festivities lies in the universal rhythms of the earth and nature. The earth, in its movement on an elliptical path around the sun experiences four important events: Winter Solstice (longest night of the year), Summer Solstice (longest day of the year), and the two equinoxes (when day and night are equal in length). In Northern Hemisphere, when the earth moves from the winter solstice toward the summer solstice, in the middle of the way, it faces the spring equinox. At the beginning of the spring when the earth wants to wake up from its winter sleep, and change from snow and coldness to color and warmth, the spring equinox occurs. A complete turn of the earth around itself makes up a day. Along its elliptical path around the sun, the earth completes a turn in 365 days, 5 hours, 48 minutes and 46 seconds making up a complete year. In four years those additional hours make up a complete day and then we have a leap year, which is one day longer than normal years. Historically the New Year celebration goes back to the times of the legendary king of Persia, Jamshid, who is said to have introduced the solar reckoning into the Persian calendar, and also determined the time when the sun enters the constellation of Aries from Pisces constellation, as the beginning of the year. According to tradition, the Sal Tahvil or the Sa'ate Tahvil is the first moment of the new year. Every year the equinox occurs at a different point in time, so the date, although accurately measured (to the day and time) is different each year, but close to March 21st. The Sofreh Haft Sin (Haft Seen) is the cloth spread on the floor, around which the family gather to celebrate the New Year. It is the focal point of the celebration and as such Iranians take great care and pride in putting together a lavish and elaborate spread to signify all that they want in the new year. The word Haft Sin means seven Ss. Sofreh means cloth usually a nice rich material or embroidered fabric. On the cloth are laid the seven specific things that start with "s". The sofreh is prepared a day or two before Norooz, placed either on the floor or on a table and remains there for about two weeks after Norooz. In addition to the seven items, you may find additional items on the sofreh that will signify renewal, happiness, wealth, good health, or anything that you desire for the New Year. The contents of the Haft Sin are usually: sabzeh (green sprouts), senjed (a sweet, dry fruit of a lotus tree), samanu (wheat pudding), sib (apple), serkeh (vinegar), seer (garlic), sekkeh (gold coin) plus gold fish. The gold fish in a clear white bowl represents life and joy. And of course a volume of the Holy Koran is always an important part of the Haft Sin. Zoroastrianism has a rich heritage of mythological and astrological symbolism that illustrates the significance of Norooz. This symbolism is reflected in the stone relief of the great palace and ritual center of Persepolis, built by the Achaemenid kings of the first great Persian Empire (c. 600 BC – 330 BC). 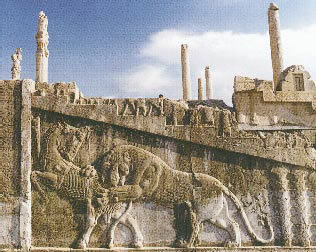 Carved in the walls of Persepolis in relief is the symbol of the lion attacking the bull. These animals stand for the sun (lion) and the rain (bull). They stand for summer (the lion, or Leo, ruling during the summer) vanquishing the bull (ruling during the rainy season), symbol of rains. Other carvings at Persepolis show processions of nobles and representatives of the various peoples of the Persian Empire bringing gifts to the Persian king, during the Norooz festivities. In Zoroastrianism, light is the great symbol of God and Goodness, whether it be the light of the sun or of the sacred fire. The spring equinox and the lengthening of the days is thus a symbol of the victory of light over darkness and of warmth over the cold of winter. From its earliest origins Zoroastrianism has honored these natural rhythms and cycles, both with agricultural festivals and with cosmic commemorations of yearly astronomical events. The world, fashioned by the Wise Lord, shows forth the divine in all aspects of nature, and the Lord is honored in festivities like Norooz, in which heavenly symbolism is joined with a celebration of the renewal of the earth in spring. On the eve of the last Wednesday before the New Year's Day, Iranians make large fires and jump over them asking the fire to give them its red color, meaning health and happiness, and warmth. On the 13th day of the new year Iranians go out on a picnic to put "out" the bad omen of the figure 13. They spend most of the day outdoors and must have their lunch outside their homes. On this day people make knots in grass and make wishes, maiden girls normally wishing good looking young men to come and seek their hands in marriage!